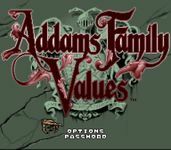 "Addams Family Values is an Action RPG based on the film of the same name produced by Ocean Software and released in 1995 for the Sega Mega Drive and Super NES. Loosely based on the plot of the film, the player takes the role of Uncle Fester as he searches for the recently kidnapped baby Pubert. On the way he receives help from The Addams Family and a host of original characters from the game. An action adventure game with slight RPG elements (you gain more hit points while proceeding in the game, can upgrade your equipment and special attacks). You control Fester, by moving him around, fighting regular enemies and bosses, talking to members of Addams household, and occasionally solving puzzles. The combat is pure action, Zelda-style. Source: Wikipedia, "The_Addams_Family:_Pugsley's_Scavenger_Hunt," available under the CC-BY-SA License.